Despite the news this week that the U.S. Chamber of Commerce and the National Association of Manufacturers have filed a lawsuit against the Securities and Exchange Commission over the conflict minerals regulation, both companies and activists continue to fight for progress. On November 15, when shareholders of the major tech manufacturer Cisco attend their annual meeting in Santa Clara, California, they will have an opportunity to take important steps towards improving the company’s policies relating to conflict minerals. 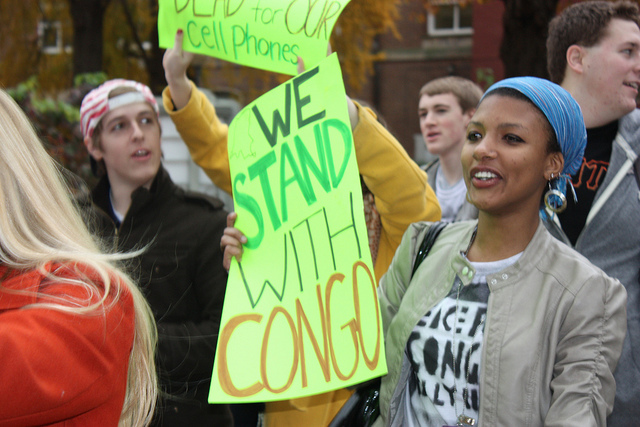 A measure will appear on its investor ballot which, if passed, would require the company to produce a report informing shareholders of the likelihood of removing conflict minerals from Congo from its supply chain, thus taking an important step towards reducing Cisco’s complicity in the violence in Congo. The proposal, filed by activist shareholder John Harrington, calls on Cisco to inform shareholders of “the risks associated with the use of those conflict minerals, as well as the relative costs associated with eliminating problematic sources and materials.” Harrington is the president and CEO of Harrington Investments, Inc., an investment firm committed to the idea that their investments have “have significant social, environmental, and political impacts on their communities and the world.” In the proposal, which can be viewed in full on page 27 of their 2012 Proxy Statement, Harrison cites figures from the International Rescue Committee (pdf) and the United Nations on the dire humanitarian situation in Congo that is perpetuated by profits from conflict minerals. In their statement of opposition, Cisco urges their shareholders to reject Harrington’s proposal, arguing that they have appropriate existing policies (pdf) on conflict minerals and are leaders in the industry’s work cleansing their supply chain. However, not enough action has been taken alongside their existing policy. Cisco must speak out against the Chamber of Commerce’s attack on the conflict minerals provision and implement the suggested steps for companies in our company rankings (in which Cisco is not currently ranked). With Section 1502 of the Dodd-Frank bill under continued assault from the Chamber and NAM, companies can expect to be increasingly challenged by activist-led initiatives to ensure that the conflict minerals provision they fought for is not lost. Our supporters are using the action on our Company Rankings page to call on companies to immediately issue a strong public statement in opposition of the lawsuit. Activists know that companies’ full compliance with the regulations, which has already been proven to reduce profits to armed groups, is just the first in a multi-step process that is needed to bring peace to eastern Congo. Enough’s supporters and partners will continue to find innovative ways to fight against industry efforts to kill, weaken, or find loopholes in the regulations, as well as actively encourage more investment by companies in alternative livelihood projects and clean supply chains from the region. Shareholder resolutions and conflict-free resolutions at the university, city, and state levels are just the start. Allison Punch contributed to this post.